As the world is heating up because of global warming we need more air conditioning systems. This is why the latest invention from the U.S. National Renewable Energy Laboratory may change the world. Using indirect evaporative cooling, and desiccants this invention would use up to 90 percent less energy and wouldn’t need CFCs to operate. 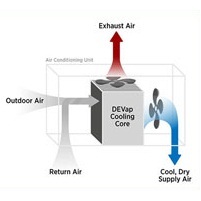 These A/C systems could be commercialized within five years and would replace easily current systems. These news prove once again that huge energy quantities can be saved and that the use of dangerous substances can be avoided through scientific research. Let’s hope such breakthroughs will keep occurring !